Supergirl wears its political and ideological leanings on its sleeve. That’s just part of the package when you watch the series, and to expect something else—especially four seasons in—is to simply expect a different show. Subtlety isn’t its particular brand of creative currency, but that only really becomes a problem when that lack of subtlety doesn’t quite jibe with the series’ established world—like when we were supposed to believe that President Wonder Woman’s administration was pro-border wall or when people chanted “LOCK HER UP” at Lena Luthor. On a larger scale, it also helps that this season allows Kara to exist more as Kara Danvers, not just as Supergirl/Kara Zor-El. So with the Agent Liberty and Children of Liberty storyline, again, lack of subtlety is the name of the game. But the show is genuinely succeeding when it comes to things like Sam Witwer’s work as Ben Lockwood/Agent Liberty, David Ajala as Manchester Black, and even Kara’s worldview being challenged when she has to realize just how bad things have really gotten on Earth after the past three seasons of alien invasions, crises, and destruction. On that last point, when Supergirl realizes that Kara is far from perfect and challenges that—forcing her to learn—it can be something pretty special. (Last season, Kara spent the majority of her time refusing to do that, instead deciding to give up on being Kara at all. It was not “pretty special.”) But in challenging Kara, that also means Supergirl has to challenge its very black-and-white concepts of right and wrong, good and bad. Only, “Rather The Fallen Angel” really doesn’t do that; instead, the episode reinforces very simple, rigid definitions of what those things mean, and it does so while also focusing on characters and situations the audience has no reason to care about. 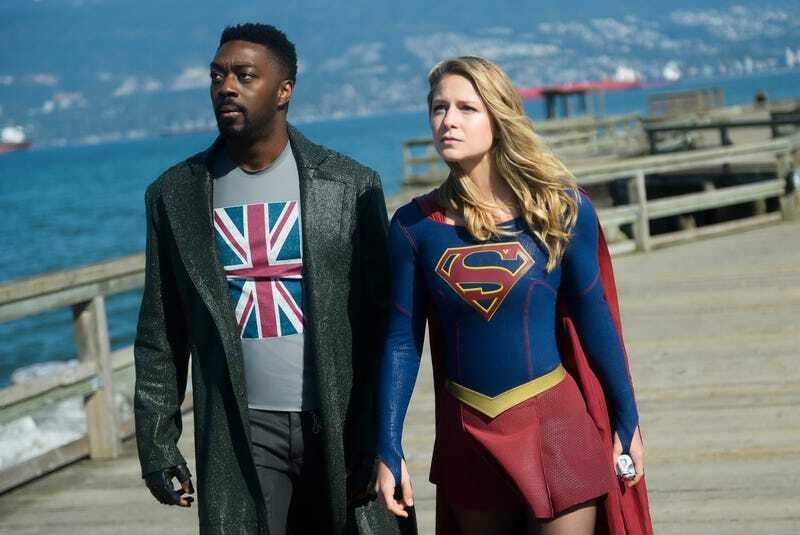 Part of the general appeal of Supergirl is how much it’s the anti-Arrow in terms of its lightness and optimism, and it’s impressive that the darkness of the Manchester Black character doesn’t actually bog the series down the way it would a show like The Flash. (Once The Flash got dark, the amount it had to do to dig itself out of that pit was… Well, at least we have Legends Of Tomorrow.) Manchester’s presence is even welcome on this show, as much as he represents a type of vigilante justice Supergirl doesn’t exactly do, since it’s very much about “superheroes” instead of “vigilantes,” in general. But while this is a welcome presence as a viewer, with characters like Kara and J’onn having a very definitive, black-and-white (anti-murder) stance when it comes to their good guy code, the show is telling a story of Manchester as a threat… even when his way actually gets more results than anything else so far. As much Arrow has done to tell the audience and its characters that killing even for a good cause is wrong—no matter how much Oliver Queen actually liked it—Oliver is still ultimately considered a “good guy,” a hero. And Manchester would probably be considered the same if he were doing all of this on Arrow instead. I can’t really say Supergirl is giving its audience mixed messages about what constitutes as a good guy and a bad guy in the Arrowverse, because I can’t really say Supergirl does a good job in this episode selling that Manchester Black really is a “bad guy” at all. Misguided, yes. Selfish, yes. Broken, definitely. But as Kara calls him “bad,” it doesn’t quite land. Especially when you consider the people he’s going up against, as this episode has its heroes call Manchester “bad” for killing men who are ready to commit full-on genocide—while it also ignores that “good guy” Tom was just tagging alien households with his poor alien-tracking pup on for his “peacefully protesting” buddies, before they went “missing.” And he only didn’t end up like them because James interfered, not because of any actual moral realization at the time. It doesn’t help that “Rather The Fallen Angel” kind of just falls apart when it comes to the action climax, so it can’t just distract from the plot with that. The alien dampeners on Shelley Island apparently don’t dampen Supergirl all that much—everything about the relative weakness and strength she displays inside the monument, before Manchester helps, is simply baffling—and James is apparently able to fight the Children of Liberty by himself (with some backup from Tom), yet only attempts to do so after they’ve already gotten him to say how much he loves them on a video recording. This is an episode that just can’t seem to elicit the right reaction for anything, even when it comes to tension: The “twist” that Manchester isn’t going to be meeting with the real Agent Liberty is given away before it’s actually revealed, as the room Lockwood’s in when he’s working on his speech is so very clearly the green room for his show and not an office on the island. That’s something that could have worked better had they not shown a clip from his new show until later, but his show also had to be seen by Supergirl, Alex, and Brainy to keep the five missing Children of Liberty in the forefront. We know certain things to be true: Supergirl, good; Agent Liberty, bad. But as Arrowverse viewers, we also know you can’t equate someone looking for street justice against very bad guys as the same type of bad as them. Manchester deserves to pay for his sins—surely someone has the jurisdiction to arrest this man who’s not even hiding—but at the same time, how can you argue against the fact that he’s getting more done against the Children of Liberty than anyone else right now? (This is not a good episode for Supergirl, James, or J’onn, as they’re all duped.) These terrorists—something the show acknowledges they are but still allows characters to be perfectly willing to ignore (such as James, who pays for it with his “reputation”)—aren’t slowing down in their hatred and violence, yet this episode somehow makes something like a “precise, nuclear explosion” not seem like that big of a deal. This is also what can be so frustrating about Supergirl. I read a comment on one of the recent episodes about how there’s something fascinating about Supergirl being the CW DC series that’s go-to move is attempted peace. The thing is, as admirable as it is, it can make the heroes look ineffectual and incompetent—as well as naive—because their opponents are never playing with the same rules, having no problem literally nuking the heroes. (For example, the last thing the DEO needs is nonlethal weapons: It needs extensive background checks on its employees because as this season has proven on more than one occasion, there’s clearly a failure there.) If a this season of Supergirl is able to end up with pacifism triumphing over violence, that would actually be pretty great. But “Peace, Kara! Peace!” isn’t as catchy as “Run, Barry! Run!” and it opens a can of worms when the true villain of the season is pure hatred. But McGrath’s also given a scene partner the audience has zero reason to care about, in an episode where Supergirl desperately needs to give the audience something to care about. Elsewhere, we know Supergirl isn’t going to get blown up; we know Manchester isn’t going to get his revenge yet, even if he ends up getting an answer to one of his questions; and to care about James’ dilemma when it comes to his reputation, Guardian, the Children of Liberty is to perhaps be watching a completely different version of the series, one where Guardian has ever been good or James has a reputation. In my Riverdale reviews, I regularly suggest that the children in that show’s cursed town should go to actual therapy, but the scenes here between Lena and Adam would certainly play better if they were just Lena in therapy. Especially since the parts of their scenes where the audience is supposed to care Adam are some of the most confusing (in terms of why the audience should care) of the episode. It took a relatively long time for me to hop on the “Why is Mon-El here?” train for Supergirl, but Adam functions as a condensed, greatest hits version of a lot of people’s problems with that character. McGrath might as well be playing off an actual lab rat, as the emotional weight would probably be greater. We don’t know Adam’s brother, we don’t even know Adam, and Adam’s last-minute plea for Lena to test him comes off as more selfish and desperate than Dana Horgan and Katie Rose Rogers’ script intends. Adam’s work as a sounding board at least allows Lena to reveal some absolutely heartbreaking things about herself, her life, and even her state of mind, but everything he does to connect might as well be Charlie Brown’s teacher speaking. His death means nothing to the audience, though at the very most, it means something in terms of Lena not being the bad person she seems to think she is. “Condensed” is a good way to describe “Rather The Fallen Angel” in general, as it’s basically a condensed version of James actually infiltrating the Children of Liberty (as it turns out, it was a bad idea, and he didn’t even have to properly go undercover to learn that), a condensed version of Supergirl doing just about anything (everyone is pretty much two steps ahead of her this week), and it even condenses the very concept of Detective J’onn (as Manchester Black just hits him with an empathy amplifier and a psychic link to let him know what’s up). Alex and Brainy are on the sidelines as James and Lena’s moral and ethical dilemmas take center stage, and Supergirl’s existence is mostly just as the character whose name is in the title. Witwer, Ajala, and McGrath’s performances keep this episode afloat—and David Harewood’s performance at the end, when J’onn cries and apologizes to Kara, is a last-minute standout—but they’re all connected to Supergirl’s particular issues with the concept of good and bad. In case you missed it: I am not Caroline Siede. Hopefully you won’t hold that against me. The significance of Lena going with “Dr. Kieran?” Her middle name. Eve: “You could be preventing another civil war.” Not by giving humans superpowers she won’t. Would Manchester killing Lockwood turn Agent Liberty into a martyr or would it actually cause his followers to scatter and call it a day? Because we’ve yet to see anyone in their camp who has the way with words that Lockwood does, to carry on his message. Well, Mercy might have, but she’s dead. And speaking of Lockwood’s way with words, the moment of him working on his speech—where he changes the way he describes Supergirl, from “adversary” to “threat”—is actually a perfect touch. Ben Lockwood is not just some guy spewing hatred, he is a charismatic cult leader who knows his stuff. Lena: “I wanted someone responsible. Somebody who wouldn’t think that they knew what was best just because they had powers.” First of all, Lena still has a lot of Supergirl-related baggage left over from last season. Second of all, what exactly about Adam screamed “responsible” or someone who could shoulder that responsibility? Tom: “I guess this is what happens when we let fear guide us.” As this episode asks us to sympathize with people we either don’t know or know to be part of a hate group, it honestly wasn’t until Tom helped Guardian in the fight that I even believed he wasn’t still working for the Children of Liberty. Everything about the plan to get James to endorse the Children of Liberty screamed baiting James with his hero complex weakness, but nope, Tom just decided to stop being afraid of impending alien doom overnight. He tripped for narrative convenience, not nefarious plans. James: “Agent Liberty can do whatever he wants with my reputation. I know who I am.” At no point during any of this does James think about what his reputation will mean for his CEO role at CatCo, any of the people who work for him, or Lena Luthor (as both his boss and girlfriend). Nor does he think that this already very tense world in which he lives will be shaken by the blowing up of a monument. When it comes to James not figuring out Agent Liberty’s identity from his voice: I at least believe that what these characters are supposed to be hearing is far more muffled than the crystal clear, very distinct voice the audience hears. Spoilers for The Purge series, so just scroll on down to the comments if you don’t want to read: I’m still impressed by how Supergirl (with “Man of Steel”) and The Purge (with both “The Giving Time Is Here” and “They Will Participate”) pretty much made the same episode (with similar backstories and all) to explain their respective mysterious masked villain’s backstory. Though, The Purge’s version led to some very dark humor, while Supergirl’s version, unfortunately, comes with the baggage of Lockwood having a point. (Again, there has been so much alien damage, which makes the real world comparison this season’s going for imperfect.) Both Sam Witwer and Lee Tergesen are terrific character actors—and likable ones that can play things with more than just a hint of menace—that it makes it all the more chilling to watch their very real descents from “good guy” to villain.